The Lodge was consecrated on Saturday 25th March 1950 at the Masonic Hall, Tewkesbury and was sponsored by St. George’s Lodge No.900 who were faced with a large increase of membership after the conclusion of the Second World War. The resolution to sponsor the new Lodge was passed in November 1948 and approved by the Right Worshipful Provincial Grand Master and the Most Worshipful Grand Master. The Warrant for the Lodge was issued in January 1950. Owing to the death of the RW Provincial Grand Master Capt. F.K.Foster OBE JP, the Consecration Ceremony was conducted by Bro. W.R.S.Bathurst T.D. M.A. PGD, the Provincial Grand Master Designate. Bro. H.W. Baker PPrAGDC, a Past Master of St. George’s Lodge was nominated to be the first Worshipful Master, and of the 17 Founder Members, 15 were members of St. George’s Lodge and a total of 120 Brethren attended the meeting. During an interesting prelude to the Consecration Ceremony, the Provincial Grand Master Designate explained to the Brethren the motive for the meeting, and the derivation of the name of the new Lodge, from the Anglo-Saxon word ‘gemythe’, signifying a meeting of the waters, a very well known feature of Tewkesbury, where the River Avon meets and flows into the River Severn. The first regular meeting of the Lodge was held on 19th April 1950 at which 3 Joining Members and 1 Initiate were elected. Great difficulty was experienced in obtaining regalia owing to shortages of material after the war, and St. George’s Lodge assisted by allowing the new Lodge to use their regalia until we were able to obtain our own, and this in addition to allowing the use of their furniture and other equipment is something that we are eternally thankful for. In 1955 a member of the Lodge submitted a design for a Lodge Banner which was readily approved, and a Gloucestershire artist was asked to make a painting for it. The banner was embroidered by Mrs Wicks, wife of the Worshipful Master, and the cost defrayed by the members of the Lodge. Within the lining of the banner is a scroll of parchment bearing the signatures of the subscribers together with a Summons for the Regular Meeting of the Lodge held on 28th December 1955 at which the banner was dedicated during a ceremony conducted by the Acting Provincial Grand Chaplain, Bro. W.W.Baker PPrGChap in the presence of the Provincial Grand Master RWBro W.KS.Bathurst, 30 members and 24 visitors. The banner is now permanently displayed in the Temple. The Past Masters’ jewel of the Lodge incorporates an enamel brooch on a blue ribbon, and depicts the Mythe bridge at it is also seen on the banner. The original Masonic Hall was situated in Tolsey Lane, the Temple being very large as having been an old chapel. The dining room was a long narrow room which restricted movement very much. The present premises were acquired in 1977 and were originally a school, and included the playground and Headmaster’s house. The ground floor of the house was converted into the bar and changing rooms, the upstairs the Warden’s flat, and the playground became the car park. A history of the Lodge was written - presumably by the Secretary, Bro. E.H.Rosser PPrSGD, but no author is given - for the 21st Anniversary celebration, held on Thursday 25th March 1971, and the origin of the Lodge may be quoted from the start of that paper, as follows. "Following the termination of the 1939-45 war and the return of members of H.M.Forces, St. George's Lodge, No.900, was faced with an increasing number of applications for membership, and in 1949 discussions took place as to the possibility and desirability of forming a new Lodge in Tewkesbury. "Preliminary meetings were held at which it was agreed that a new Lodge was desirable. In November, 1949, St. George's Lodge, No.900, agreed to sponsor the Lodge, and passed the necessary resolution". This was approved by the Right Worshipful Provincial Grand Master and later by the Most Worshipful Grand Master. In January, 1950, the Worshipful Master of St. George's Lodge reported that the Warrant for the new Mythe Lodge, No.6949, had been received and that the Consecration Ceremony would take place on Saturday, 25th March, 1950. The Warrant - dated 7th December 1949 - gives the names of seven Founders, along with “others” as Petitioners. Bro F.A.Miller - (as Secretary), SD of 900. In addition, the Warrant gives the meeting dates as the third Wednesday of the eight months. This has been subject to change since then - after the first meeting, the date was always the last Wednesday, and for a considerable period there was also a meeting in May. Now it is the last Wednesday from September to April except December, when it is the third Wednesday. The Consecration of the Lodge took place in the presence of a large number of Brethren in the Masonic Hall at Tewkesbury, at 2.30 pm on Saturday 25th March 1950. The following is taken from the Provincial Yearbook for 1950-51, with some adjustments. In the presence of about 200 (only 120 signed the signature book, however) Brethren assembled this day in the Masonic Hall at Tewkesbury, the Ceremony of Consecration was conducted by the Deputy Provincial Grand Master in Charge, the Provincial Grand Master Designate, Bro. the Hon W.R.S.Bathurst, M.A., T.D., P.G.D assisted by the Officers of Provincial Grand Lodge. There were 4 Grand Officers, Including Bro. P.M.C.Hayman JP PAGR, the Deputy Provincial Grand Master Designate, 15 of the 17 Founders, and 92 visitors present, the remainder being Acting Provincial Grand Officers. The Deputy Provincial Grand Master in Charge took the Chair and his Officers their respective places. The Opening Hymn was sung by the Brethren and the Lodge was opened in the Three Degrees at 2.30 pm. "We are assembled today for the purpose of constituting a new Lodge. The name of which is 'aptly chosen and clearly defined'. The word 'Mythe' is from the Anglo-Saxon 'gemythe' which signifies a 'meeting of the waters'. The name is therefore peculiarly appropriate since this is the geographical distinction by which Tewkesbury is perhaps best known to the world. The Mythe, just above Tewkesbury on the Severn, was where the Deputy Provincial Grand Master, Bro Thomas Quarington, (first DepPGM 1818-1835) laid the foundation stone in 1823 of the iron bridge built there spanning the river. The ceremony that day was attended by an enormous number of people, including a large gathering of Freemasons in their regalia. A procession had made its way from the Town Hall to the site of the bridge, Foundation Lodge No.82 leading with Royal Union Lodge No.246 and others following. The ‘Tute’ or Royal Hill immediately above the site was apparently covered from base to brow with ‘an incalculable assemblage of well dressed persons, pre-eminent amongst whom were a great number of elegant and beautiful females’ (quoting a “History of Freemasonry in Gloucestershire”). 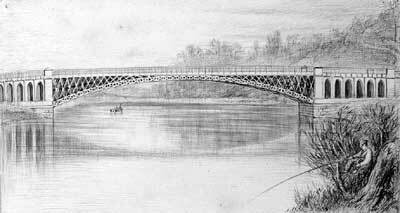 The same bridge has subsequently become the emblem of the Mythe Lodge. Of all the features of the landscape, the meeting of two great rivers appeals most strongly to the imagination. We see them mingling their floods and think of the far-off places where these waters have their source - the rolling pastures of Northamptonshire on the one hand, and on the other the romantic mountains of Wales. Are not we ourselves like a river compounded of many influences, diverse rays of lineage which centre in every human being? Ancestors, known or unknown stretch behind a man and his nature like a fan or the spread tail of a peacock. At every turn, in every gesture and look, in every decision he takes he draws on the reserves or deficits of the past. Few of us would have become Freemasons but for a certain mingling in our characters, an admixture of the practical, the everyday, with the romantic world of make believe. The word Mythe teaches us how much our civilisation owes to our diverse distant sources, to classical learning, to Christianity and even to pre-christian paganism, to classical learning taught in Ferrers Grammar School since 1576, to the Christianity of Robert Fitzhamon's Benedictine Monks and the Saxon predecessors of A.D. 715, right back to prehistoric folk lore, vestiges of which we still seem to practise in our Masonic ceremonies. In order to absorb an increasing number of worthy candidates and to prevent the increase in size of the eighty-eight years old Lodge St. George, a new lodge is now to be formed. On the lamented death of RW Bro Foster, whom we all loved so well, it falls to my lot to carry out the prescribed ceremony. I therefore call upon the Provincial Grand Chaplain for prayer."